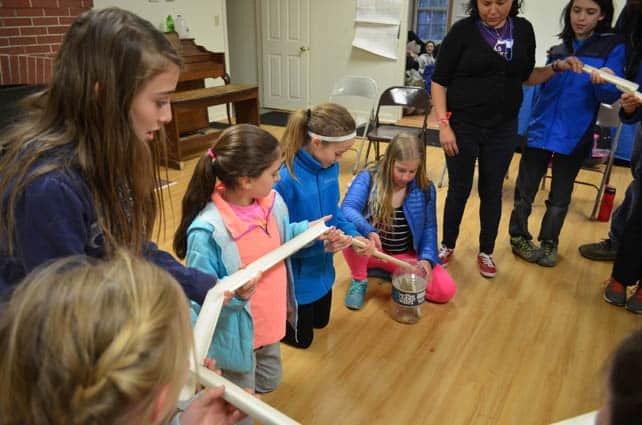 Sixth-grade students from area schools participated in activities and teambuilding during a trip to Maine. Graduates from sixth grade at Killington Elementary School joined other sixth grade graduates from Barnard, Reading and Woodstock elementary schools for a week-long trip to Ocean Park, Maine, in a tradition called “ Nature’s Classroom .” They all will be entering Woodstock Middle School in the fall, and the outing gave the kids a chance to meet each other. The week was full of educational science activities, team building skills, community style living and just plain old fun. The property had woodlands, ocean access and swamp land, which allowed for a wide array of science and nature activities. At the end of the day, they gathered in a large building called “The Schoolhouse” to recap the day’s activities, get some wind-down time and have an evening sing before heading off to the dormitories, where the girls and boys stayed on separate floors. The campus at Ocean Park included a large dining hall, where kids ate family-style meals and took turns being waitrons, serving the other students. After each meal the food left on the plates was weighed, giving the kids an idea of how much food they were wasting, and by the end of the week that number had progressively gone down. The staff was knowledgeable, fun and enthusiastic and created a great environment for students to meet before they start middle school and step up to a new phase of their education, in a larger building with a lot more kids. Their experience with Nature’s Classroom will, hopefully, make the leap a little easier for all.